SLA (Service Level Agreement) adds ability to keep track of ticket timing set in SLA Policies. You can set SLA policies in settings with conditions and time. Whenever there is any activity in ticket e.g. create ticket, change status, reply ticket, etc. SLA policies are checked for it and adds first matched policy time to it. You can add it in your ticket list. By setting it default orderby in ticket list setting, you do not need to order it manually every time to check overdue tickets. This way, you can take actions on ticket as per SLA timings and keep your customers happy. There is setting available to change color of within SLA and overdue timings in ticket list. 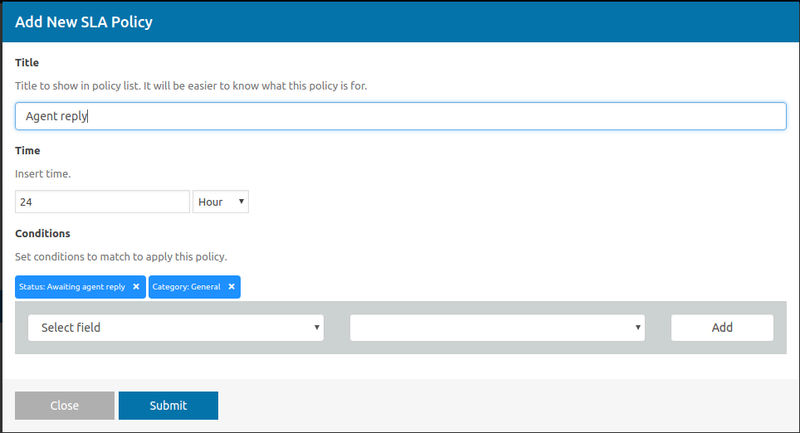 You can re-order policies so that important policy get priority to execute. Only first matched policy will get executed for the ticket. You can create ticket for pre-sale questions.